Disrupting the common assumption that the Victorians regarded their eighteenth-century predecessors with little interest or with disdain, the essays in The Victorians and the Eighteenth Century propose a re-examination of these relationships. 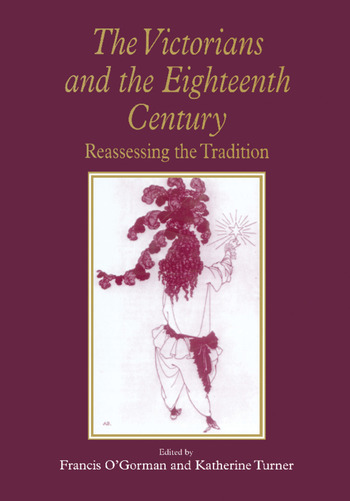 Together, they expose some of the significant and complex ways in which key aspects and texts of the eighteenth century were situated, read, and transacted within the post-Romantic nineteenth century. Individual essays examine the influence of the work of Pope and the eighteenth-century novelists such as Johnson, Chatterton, and Rousseau on a range of Victorian writers and cultural productions, including Dickens, Eliot, Oliphant, Ruskin, historical fiction, late Victorian art criticism, The English Men of Letters series, and the Oxford English Dictionary. The contributors challenge long-held views about Victorian uses of the past, and offer new insights into how the literature and culture of the eighteenth century helped shape the culture and identity of the nineteenth. This collection of essays by an impressive array of scholars, with a Preface by David Fairer, represents a unique approach to this area of literary history and offers new perspectives on the nature and methodology of 'periodization'. While it is obviously of great interest to students of eighteenth-century and Victorian literature, it will also appeal to readers more broadly concerned with questions of literary influence, periodization, and historiography. Contents: Preface, David Fairer; Introduction, Francis O'Gorman and Katherine Turner; The debt to society: Dickens, Fielding, and the genealogy of independence, Helen Small; George Eliot, Rousseau, and the discipline of natural consequences, Simon Dentith; 'The dreams of thy youth': Bucks, Belles and half-way men in Victorian fiction, Carolyn D. Williams; The 'high priest of an age of prose and reason'? Alexander Pope and the Victorians, Francis O'Gorman; The cultural politics of 18th-century representation in Victorian literary histories, Elisabeth Jay; The 'link of transition': Samuel Johnson and the Victorians, Katherine Turner; Departures and returns: writing the English dictionary in the 18th and 19th centuries, Lynda Mugglestone; Ruskin's revised 18th century, Dinah Birch; Sincerity in every department? Masks, masculinity, and market forces in 18th-century English Men of Letters, David Amigoni; 'I am nothing': a typology of the forger from Chatterton to Wilde, Nick Groom; Regarding the 18th century: Vernon Lee and Emilia Dilke construct a period, Hilary Fraser; Bibliography; Index. Francis O'Gorman is Senior Lecturer in Victorian Literature at the University of Leeds and a Fellow of the Royal Historical Society. His books include John Ruskin (1999), Late Ruskin: New Contexts (2001), and Blackwell's Critical Guide to the Victorian Novel (2002), and Victorian Poetry: An Annotated Anthology (2004); he has also edited, with Dinah Birch, Ruskin and Gender (2002). Katherine Turner is Associate Professor or English, Mary Baldwin College, USA. She has published on eighteenth-century poetry, travelogues, and women's writing, and her most recent publication is British Travel Writers in Europe 1750-1800: Authorship, Gender and National Identity (2001).